At The Blind Alley, we offer several ways to shop for your window covering needs. We are located in the Overlake area of Bellevue, not far from Microsoft's Redmond Campus. Visit our showroom for ideas and assistance regarding the window covering products we carry, or contact us for a free appointment in your home within our local service area. You can also view our online portfolios of projects we have completed in the Seattle metropolitan area, including window treatments in Casual and Formal settings, as well as Top Treatments, Childrens' rooms and Specialty windows. And check out our current Promotions here. Hats off to Hunter Douglas Platinum Technology. The newest addition to the Platinum family, the Gateway and Repeater System was recognized by Electronic House, an important industry magazine, in its 2014 Products of the Year competition. The Platinum Gateway and Repeater System was the only winner in the motorized window treatments category. The Gateway is similar to the WCMA award-winning Platinum App Bridge and is used primarily for integrating Hunter Douglas window fashions with home automation systems. To learn more about this award-winning system contact a Hunter Douglas Certified Motorization Specialist dealer such as Blind Alley. 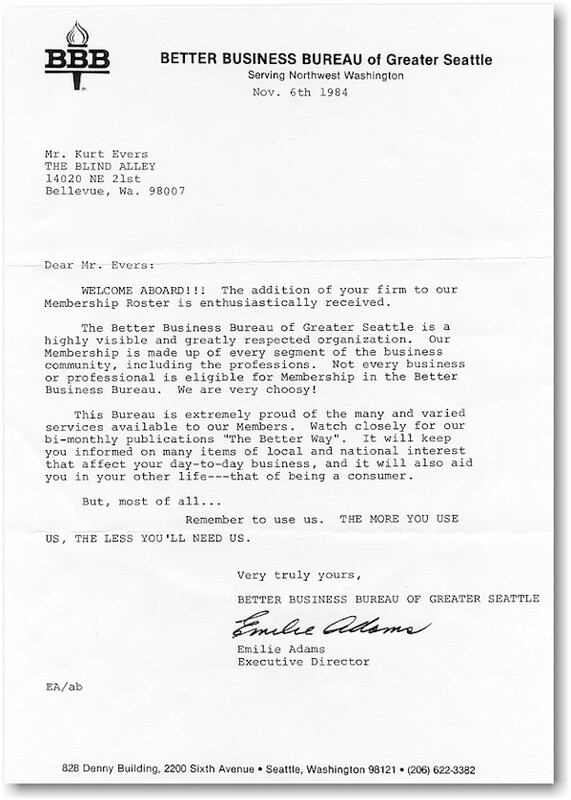 Blind Alley is proud to be recognized as one of the select Certified Hunter Douglas Motorization Specialists in the Seattle area. Our automation solutions work with every Hunter Douglas motorized application and integrate with home automation systems. To achieve this exclusive designation, Blind Alley completed a comprehensive program in hard-wired motorization that certifies us to sell Hunter Douglas hard-wired motorized products on an exclusive basis and ensures that we are committed to project excellence with the highest standards. 2014 was our 30th Anniversary! Click here for more information about The Blind Alley in 1984. Our first priority is customer satisfaction. To provide a positive buying experience, we offer full service from your first shopping visit, through final installation and beyond with our Lifetime Installation Warranty. To start, we have a comfortable showroom full of displays and product sampling, Our friendly, expert staff is available to answer your questions and offer guidance in your window covering decisions. 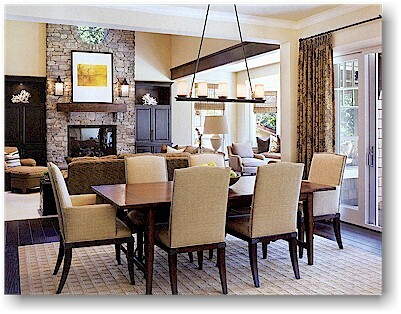 In addition, or if you prefer shopping in the comfort of your own home, we have a full staff of professional decorators. They will bring samples to your home, measure your windows, offer expert advice and give you an estimate. At no cost or obligation to you. So that you can feel confident about your purchase, we carefully select top quality products manufactured by companies with excellent customer service records. Our Service Department ensures that your order is placed with accuracy and completed in a timely manner, as well as coordinating the installation appointment with you. Our installers are company employees (not subcontractors) experienced and friendly, and their work is guaranteed for as long as you own your window treatment. We have been in business since March 1984 and members of The Better Business Bureau since November 1984. We strive to keep our customers satisfied with our products and service for years to come. As of December 31, 2016 we have processed 128,920 custom window covering orders and have 19,244 current customers in our local service area. Enjoy your shopping experience at The Blind Alley. The Blind Alley was opened March 31st, 1984 in Bellevue, Washington by Gene & Kurt Evers. Locally owned and operated, and unlike franchises, such as Budget Blinds, which "trains" new franchise owners in weeks, our owners have extensive experience in the custom window covering trade dating back to 1967 in Bellevue. 50% of our staff have been with us 20 or more years. 6% of our staff have been with us 10-20 years. 17% of our staff have been with us 5-10 years. 28% of our staff have been with us less than 5 years. 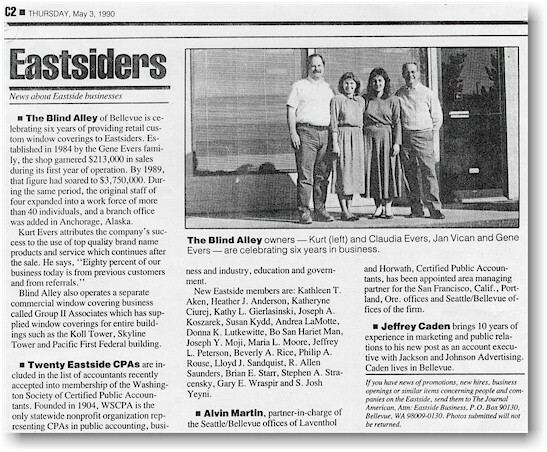 The Blind Alley was an offshoot of Group II Associates, founded in 1981, also by Gene & Kurt Evers. Group II Associates specializes in large commercial projects and the opening of The Blind Alley was a response to requests for a residential version of Group II Associates. 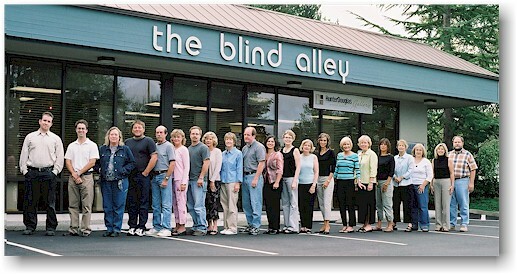 The complete staff of The Blind Alley, averaging over 16 years each with our Company! 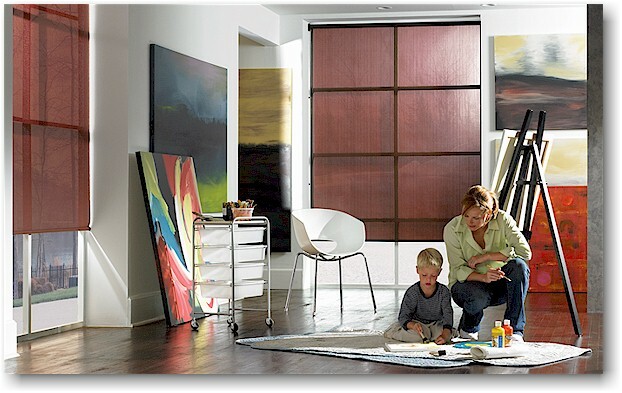 In July 2003 The Blind Alley joined more than 480 other dealers nationwide participating in the exclusive Hunter Douglas Gallery program, which is limited to dealers selected by Hunter Douglas for their knowledge and expertise regarding Hunter Douglas products and services. Click here for directions to visit our Hunter Douglas Gallery in Bellevue, Washington. 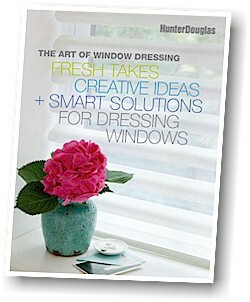 Stop by and receive your free copy of "The Art of Window Dressing", a full color 48 page window decorating guide published by Hunter Douglas. Inside you'll find beautiful pictures and detailed descriptions of the entire collection of Hunter Douglas custom-made window fashions - all perfectly suited to complement today's most popular decorating styles. Click here to view our online Hunter Douglas Gallery Portfolio. Or click here to visit our Hunter Douglas Gallery website. Click here to view our Showroom Portfolio. Click here to view our Window Fashion Designers Portfolio. You'll find it all at the Hunter Douglas Window Fashions Gallery� located right in our store. We'll help you increase the comfort, beauty and value of your home. You'II also have a thoroughly satisfying shopping experience. We guarantee it. All of our Hunter Douglas products are custom made and come with the Hunter Douglas Lifetime Guarantee to protect you against any unlikely defects in workmanship. And as a Hunter Douglas Gallery, The Blind Alley can also offer you the Hunter Douglas Right Choice Promise. Click here to view our current specials, promotions and coupons for our Local Service Area of greater Seattle, Washington and the Eastside. 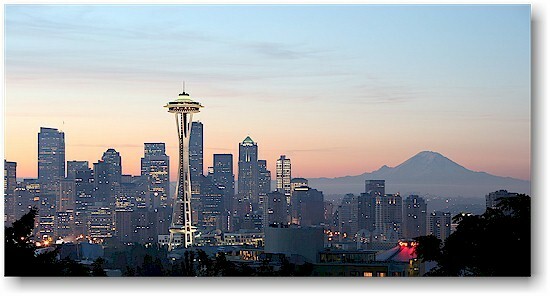 The Blind Alley is located in Bellevue, Washington just east of sunny Seattle. Click here to get local driving directions. Click here to view our local business hours. Click here to view our contact phone numbers. Click here to visit our Showroom Portfolio. Or click here to make an appointment for a Free In-Home Consultation with one of our Window Covering Designers in our Local Service Area. 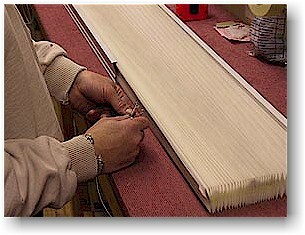 The Blind Alley of Bellevue, Washington is a Window Covering Service and Repair Center specializing in the repair of Hunter Douglas and Levolor window covering products. Click here for more information regarding our Repair Service Center. Follow this link to our Measuring Form in Adobe PDF format that you can print out and use as a guide when measuring your windows for custom blinds and shades. This form will help you when placing your order as it includes all the vital information needed to complete the Order Form. You will need the Free Software to view and print Adobe PDF files. DA STARK Interiors is a full-service firm with projects that have encompassed sophisticated urban residences to casual weekend retreats as well as innovative work environments. Need help cleaning your custom window treatments? Especially Silhouettes, Luminettes and Duette Honeycomb Shades? For Ultrasonic Cleaning of Mini Blinds and Vinyl Verticals, Wood and Faux Wood Blinds, for Dry-cleaning of Draperies and Bedspreads, Swags and other specialty top treatments such as Cornice Boards, Woven Wood Shades and Roman Shades, we recommend Alpine Specialty Cleaning. Don't move into a fishbowl! Add your window treatments from The Blind Alley into your mortgage package and move in to a truly finished home, with all the privacy and security you could desire. Visit our Home Builders programs with Westcott Homes. Click here to view the Kitsap County house featured on ABC's Extreme Makeover, Home Edition television series, in which The Blind Alley was the supplier of all of the custom Hunter Douglas Window Coverings. Click here to view the Kaslo home, one of seven spectacular show homes at the 2005 Seattle Street of Dreams at Nolan Woods in Woodinville, Washington. The Blind Alley was the supplier of all of the custom blinds and drapery treatments, including Hunter Douglas Alustra Silhouette and Vignette Window Fashions. Hunter Douglas, the nation's leading manufacturer of custom window fashions, held its first-ever International Alliance Conference at the Colorado Convention Center in Denver. 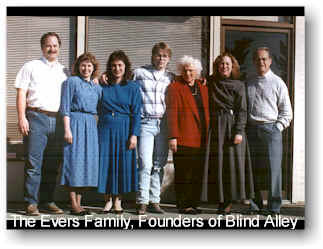 The conference ran from July 25 to 27, 2007 and Kurt & Claudia Evers, owners of The Blind Alley of Bellevue, Washington were among the more than 4,000 attendees. Click here to visit our Customer Comments & Suggestions Page. Click here to search our Website or visit our website Navigation page or website Directory. � Copyright 1997, 2017 Blind Alley�, Inc.